LiAngelo Ball appears to be attracting interest from overseas clubs. On the latest episode of 'Ball in the Family', LiAngelo revealed that he had received an offer from the London Lions of the British Basketball League. Nevertheless, it appears that Ball remains focused on remaining in the USA in order to chase his dream of playing in the NBA. It probably sounds a little crazy to other people, but I think my best path to get to the league is to join the G League instead of the London Lions. LiAngelo is the younger brother of Los Angeles Lakers starting point guard Lonzo Ball, and the 20-year-old recently had a successful spell with the Los Angeles Ballers of the Junior Basketball League. The shooting guard has also become a prominent name thanks to both his outspoken father and his involvement in the 2017 UCLA Chinese shoplifting controversy. The incident in China resulted in LiAngelo being suspended from his college, and in the aftermath, LaVar Ball engaged in a public exchange with President Donald Trump. The British Basketball League is among the worst in Europe, and it would be a step back for LiAngelo to head to the United Kingdom. Nevertheless, the current G-League season is quickly coming to an end, and it remains unlikely that Ball will receive a call ahead of the end of the season. 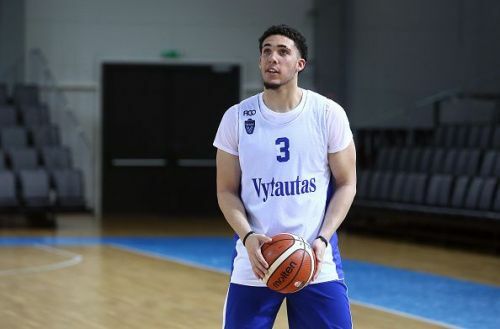 Ultimately, Ball's prospects in America currently look limited due to LiAngelo's outspoken father, although the youngster should still be applauded for aiming higher than the London Lions. While it remains to be seen what LiAngelo's next step will be, his older brother's Lakers team are in action later tonight as they take on the Memphis Grizzlies.